He was raised as one of nine children on a farm in western Virginia. Self-taught, he rose to become a Texas Legislator, newspaper editor, and advisor to governors. He foresaw the need to abolish slavery, and the inevitable defeat of the Confederacy. He believed in the Union, and fought to defend it as a Colonel in the US Army. John L. Haynes was the eighth child and fourth son of John Haynes (1776-1830) and Elizabeth Scott. He had four older sisters, three older brothers and one younger brother. He was born in Liberty, Bedford County, Virginia on July 3rd, 1821, in the first months of the second term of President James Monroe. The explorer Daniel Boone had died the previous December at 85. Among other events that year that would figure prominently in John's life, Moses Austin proposed to settle 300 American families in the then Spanish territory of Texas. After his family left Virginia for Tennessee, John and his brothers Malcolm and James moved on to the city of Jackson, in Holmes County, Mississippi. A common route in those days was the Natchez Trace. John became editor in 1845 of The Lexington Advertiser, one of the leading newspapers in Mississippi. His younger brother James was elected Sheriff in 1850, serving for over 10 years. John and James would later end up on opposite sides in the War Between the states. The ongoing border conflicts between Mexico and the newly formed Republic of Texas, finally broke out into war between the U.S. and Mexico in 1846. John joined the conflict as a Lieutenant of Volunteers from Mississippi, commanded by Jefferson Davis, serving in the army of General Zachary Taylor. This unit was involved in a successful all-out Bowie knife charge against the Mexican troops. Service in the war brought John in contact with men who were destined to be future leaders of the new State of Texas; Sam Houston and Edmund J. Davis. In February 1848, the U.S. signed the Treaty of Guadalupe Hildago, ending the war with Mexico. The United States received over 500,000 square miles; land that included what became the states of California, Nevada, Utah, most of New Mexico and Arizona, and parts of Wyoming and Colorado. Texas was also conceded to the United States, with the boundary at the Rio Grande. This made the United States a trans-continental Republic, reaching from the Atlantic to the Pacific. Ominously, however, it also opened up land to be disputed by pro- and anti-slavery forces. After peace was made with Mexico John settled in Comargo, a town south of the newly established border, in Mexico, where he built a successful mercantile business. In 1849 he moved his business across the border to Rio Grande City in Texas. While serving in the Army of General Zachary Taylor, John had met an army surgeon who was to be his future father-in-law. Dr. James A. Wells, a native of New York had settled in Fayette County in 1836 with his family, including a year old baby girl named Angelica. Several years later, on May 15, 1851, John would marry Dr. Well's 17 year old daughter Angelica in Rio Grande City, Texas. Angelica was named for her paternal grandmother, Angelica van Buren, a cousin of President Martin van Buren. Angelica Wells brought to Mr. Haynes a formidable array of relatives. Her maternal grandfather was General Samuel Evans, and her cousin Samuel Evans was an early Texan who fell at the Battle of the Alamo. Later that year their first child was stillborn, but she then bore him four sons followed by one daughter. Desiring to take part in the future of the Border, John entered into politics. After winning a county office, he sold his business in order to give all his time to public affairs. In 1857 he ran for a seat in the legislature from Starr County and was elected. He ran and was re-elected in 1859. When the legislator, his wife, and their three young sons arrived at the capital in 1857, events were building to a head over abolishment and states rights, events which were to changed his life and career. As soon as Mr. Haynes was seated in the legislature, he was forced to take sides on great national issues. Party organizations had crystallized during Governor Pease's administration. 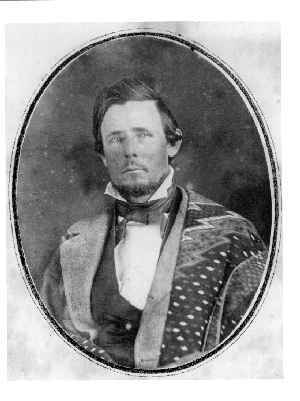 Mr. Haynes, in spite of his birth place, was moved by sincere convictions to join the anti-secession group. In the eyes of many he became "a black Republican" early in his career. The legislator loved Texas, however, and he began to write numerous articles for the newspapers to express his views on political issues and his strong faith in the great future of Texas. His clear editorials in The Southern Intelligencer drew attention to him and he was engaged by The New York Tribune as a correspondent. Matters came to a head on February 23, 1861, when the citizens of Texas failed to return enough ballots in time to stop Texas from seceding from the Union. Mr. Haynes, in defense of his stand on secession, had written many newspaper articles setting forth the advantages that annexation had brought to Texas, and also calculating the cost of secession and the relative size of the potential armies. Using figures from the recently released 1860 census, he showed the South would be out-manned by 3 to 1 in any armed conflict. John's position as a legislator was now untenable, and he resigned in the spring of 1861. His friend Edmund J. Davis was forced to resign his judgeship, and John and Edmund Davis fled the state. They traveled to New Orleans, then on to Washington, where they met with President Abraham Lincoln, who agreed to provide arms if they could raise troops. On October 26, 1862, Davis received a colonel's commission and authority to recruit the cavalry which became the First Texas Cavalry (U.S.) John Haynes was commissioned as a Colonel and served under Davis until Davis was captured by Confederate troops in March 1863 in Matamoros. Col. Haynes was then decommissioned with an honorable discharge. In August of 1863, John wrote General A.P. Banks stating he could raise a regiment, and requesting he be re-commissioned as Colonel, a request which was ultimately successful. He then led the combined First and Second Texas Cavalry units in campaigns in the Texas-Louisiana region until mustered out on November 4, 1865. While they never met in battle, John and his brother James fought on opposite sides, for James served the Confederate State of Mississippi as a member of the Fourth Regiment of the Mississippi Volunteers Infantry, rising from private to Captain in the Quartermaster's Department, serving later in F Company, 1st Mississippi Cavalry. After the war's end, through friendship with Governor A. J. Hamilton, Military governor of Texas, Haynes received a coveted four-year appointment as Collector of Internal Revenue of the Third District. In 1867, two years after Col. Haynes returned from the War, their daughter Mary was born and was baptized at the reunited church on the hill, renamed St. David's. The church stands today, on a busy Austin street corner, complete with a stained glass window in honor of her parents donated by Mary, who became a world renowned stage actress taking the name Mary Van Buren, after her grandmother. An unsuccessful run for a congressional seat from the Fourth District in 1870 left him unemployed, except for an interest in The Austin Daily Republican. In the following year, under the Reconstruction Governor E. J. Davis, his former commander from the First Texas Cavalry, Col. Haynes received an appointment which was to so greatly benefit the Lower Rio Grande Valley land owners of porciones grants. The Texas Legislature authorized, on April 24, 1871, a commission to locate, translate, and transcribe the Acts of the General Visit in the old Spanish towns of Laredo,Puerrero, Mier, Camargo and Reynosa, twenty-three years after the 1848 Treaty which placed such lands within the United States. Col. Haynes, who was very familiar with the five border counties of Webb. Zapata, Starr, Hidalgo and Cameron, having spent more than ten years in that area, was given the task. He is acknowledged as the one person who made it possible to preserve the records of lands now located on the Texas side of the Rio Grande, (originally granted by the King of Spain). With great care, he pieced together fragments of the one hundred-year old Spanish manuscripts which had been filed in municipal records in each of the five Valley towns, four of which were still in Mexico. Only Laredo was on the Texas side. Copying these records in long-hand word for word in the original Spanish, he later translated them into English, had them bound and deposited within a year to the General Land Office of Texas, where they are today, untranscribed to type written copies. In 1872, he was given a four-year Federal appointment by President Grant, as Collector of Internal Revenue of the Third District. He retired from public life in 1884, and moved to the city of Laredo, Webb County, Texas, on the Mexican border where he lived with his son James. He wrote his final will on July 5, 1887, two days after his 66th birthday. Nine months later, he died and was buried in Laredo on April 2, 1888. The following year, his remains were exhumed by "friends" in the city of Austin. Following a large funeral ceremony in St. David's, he was buried in Oakwood Cemetery on March 7, 1889, in a Haynes plot. Within the plot lie the graves of his widow Angelica, her sisters, and their daughter Mary Van Buren. Postscript - That Mysterious Middle "L"
A final mystery remains about Col. John L. Haynes. There are at least four separate conflicting possibilities for his middle name! The first record of his name, in his mother's bible, (and in that of his Uncle David Street), has his birth name as simply John Haynes, with no middle name or initial. This despite that several of his siblings did have middle names in that bible record-- his older brothers were cited as William Scott Haynes, and Malcolm Decater Haynes; and his younger brother as James Marion Haynes. It is likely that young John adopted a middle initial or name later in life. His military and federal records, and his tombstone all refer to him simply as Col. John L. Haynes. It is important to note that Col. Haynes had an uncle on his mother's side named Lennaeus Scott, after the Swedish botanist whose classic work classified the plant and animal kingdom. Lennaeus developed the binomial system of nomenclature, e.g., homo sapiens, which work laid the foundation for Darwin's theories of evolution. His son, Dr. Henry Malcolm Haynes named his only child John Lenneis Haynes, and the family always assumed that he was John Lenneis Haynes the 2nd, named after his grandfather, in turn named for his mother's brother. The author of this text, the great-grandson of the Col., was named John Lenneis Haynes the 3rd, and named his son John Lenneis the 4th. However, Sam Houston, a close friend of the Colonel, referred to him as John Leal Haynes in his official writings. A stained glass window in St. David's church in Austin, commissioned by his daughter Mary Van Buren, calls him John Lengon Haynes. And the living descendants in Laredo have always assumed the Col. was named John Leonard Haynes, since he named his third son Leonard. It may be that he changed the name as the situation suited him--we may never know.